Feel free to take a few pieces for your personal rock and mineral collections, but please take only one of any rock type per person, so that others may collect as well. Some of the rocks are labeled below, with approximate coordinates as shown in the photograph above. Thank you, and enjoy Nevada’s great and interesting geology! A1. Skarn, a contact metamorphosed Mesozoic carbonate rock along the contact with a Cretaceous granitic rock, with manganese-rich clinozoisite, Ca2(Al,Mn)3Si3012(OH) – the pink mineral, and diopside, CaMgSi2O6 – the green mineral, Gabbs Valley Range, north of Luning, Mineral County, Nevada. A1. Dolomite, CaMg(CO3)2, (Devonian age), Simonson Dolomite, with Amphipora fossils (a reservoir rock for oil in other parts of Nevada), from the Bruffey Canyon area in the Piñon Range, Eureka County, Nevada. A2. Limestone breccia, Gold Bar mine, Roberts Mountains, Eureka County, Nevada. A3. Chrysocolla, CuSiO3·2H2O, in quartz vein associated with Jurassic granodiorite, Contact, Elko County, Nevada. A4. Turquoise, CuAl6(PO4)4(OH)8.5H2O, veinlets in a quartz porphyry, Cactus Range, Nye County, Nevada. A4. Turquoise, CuAl6(PO4)4(OH)8.5H2O, which occurs as fracture fillings in siliceous shale at the McGinness (also called the Gem) mine, Lander County, Nevada. A4. Breccia from the Quartette Vein (Miocene age), Unit Tqv mapped by J.E. 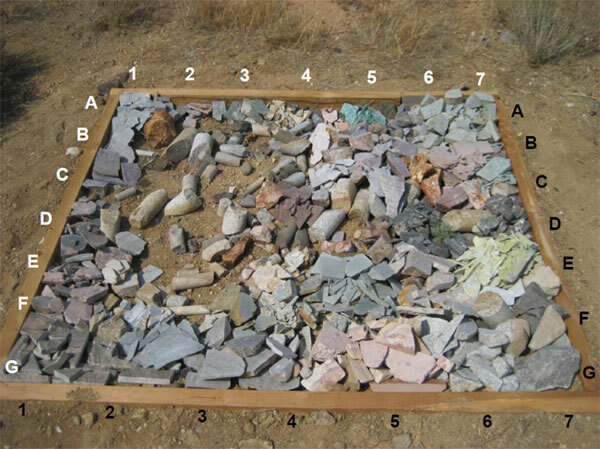 Faulds and others (2010, NBMG Open-File Report 10-13), with quartz, SiO2, hematite, Fe2O3, chrysocolla, CuSiO3.2H2O, and fragments of volcanic rock, Searchlight, Clark County, Nevada. A4. Petrified wood (wood replaced by quartz, SiO2), Montana. A4. Sinter (Quaternary age), Red cinnabar, HgS, and quartz, SiO2, and possible opal, SiO2.nH2O, where the new limited access portion of U.S. Highway 395 crosses the Steamboat hot springs, Washoe County, Nevada. A5. Chrysocolla, CuSiO3.2H2O, and quartz, SiO2,Yerington copper mine, Lyon County, Nevada. A7. Feldspar porphyry (Eocene age) with feldspar crystals partially replaced by chrysocolla, CuSiO3.2H2O, from the Phoenix Project, Battle Mountain district, Lander County, Nevada. B1. Diopside [CaMgSi2O6] - phlogopite [KMg3AlSi3O10(OH,F)2] calc-silicate rock (Cambrian-Ordovician dolomite metamorphosed during the Cretaceous and Tertiary), Ruby Mountains, Elko County, Nevada. B1. Gneiss, Ruby Mountains, Elko County, Nevada. B4. Marble, mostly calcite, CaCO3, with pink coloration from hematite, Fe2O3, Minnesota (Standard Slag) iron mine, Buckskin Range, Douglas County, Nevada. Samples donated by Alan Coyner, Nevada Division of Minerals. B5. Dumortierite, Al7O3(BO3)(SiO4)3, is the lavender- or blue-colored mineral, with greenish-brown tourmaline, Na(Fe,Mn,Li,Al)3Al6B3Si6O27(OH,F)4, (probably a solid-solution mixture of the minerals schorl, elbaiite, and olenite), andalusite, Al2SiO5, and quartz, SiO2, in this metamorphosed Rochester Rhyolite, part of the Triassic Koipato Group, Lincoln Hill, Humboldt Range, Pershing County, Nevada. B6. Porphyritic trachydacite (Miocene age), Unit Tspd mapped by J.E. Faulds and others (2010, NBMG Open-File Report 10-13), Searchlight, Clark County, Nevada. B6. Rhyolite, with crystals of quartz, SiO2, sanidine, (K,Na)AlSi3O8, hornblende, Ca2(Mg,Fe)4Al(Si7Al)O22(OH,F)2, and biotite, K(Mg,Fe)3AlSi3O10(OH,F)2, (Miocene age), Eagles House, Lahontan Mountains, Churchill County, Nevada. This rock was collected at Stop 2 of the 2011 Earth Science Week Field Trip. C1. Piemontite [Ca2(Mn3+,Al,Fe)3Si3O12(OH)], a red, manganese-rich mineral of the epidote group, and hematite [Fe2O3] in a Triassic-Jurassic ash-flow tuff, Peavine Peak, Washoe County, Nevada. C4. Flow-banded rhyolite (Tertiary age), northeastern Elko County, Nevada. C5. Dumortierite, Al7O3(BO3)(SiO4)3, is the blue- and lavender-colored mineral, with andalusite, Al2SiO5, and quartz, SiO2, in this metamorphosed Rochester Rhyolite, Triassic Koipato Group, Champion mine, Humboldt Range, Pershing County, Nevada. (samples donated by John Fulton, son of John A. Fulton, Director of the Nevada Bureau of Mines from 1929 to 1939). C6. Ferricrete. This rock is composd of fragments of other rock (Quaternary colluvium) cemented with iron oxyhydroxide (goethite, FeO(OH)) and iron oxide (hematite, Fe2O3) that precipitated from natural acid-rock-drainage spring water from a nearby mineralized area with quartz (SiO2), alunite (KAl3(SO4)2(OH)6), and pyrite (FeS2). The fragments are hydrothermally altered Miocene volcanic rocks. Age of the hydrothermal alteration was also Miocene, somewhat younger than the age of mineralization on the Comstock Lode. Geiger Grade (Nevada Highway 341), Washoe County, Nevada. C6. Breccia, silicified (hardened with quartz, SiO2, filling holes) and colored red with hematite, Fe2O3, (Miocene age), Lahontan Mountains, Churchill County, Nevada. This rock was collected at Stop 4 of the 2011 Earth Science Week Field Trip. C7. Silicified pumice. Minerals include quartz, SiO2, potassium feldspar, KAlSi3O8, and celadonite, K(Mg,Fe2+)(Fe3+,Al)Si4O10(OH)2, the green mineral, (Miocene age), Lahontan Mountains, Churchill County, Nevada. This rock was collected at Stop 7 of the 2011 Earth Science Week Field Trip. C7. “Wonderstone” or silicified and pyritized, then oxidized Miocene air-fall tuff, Lahontan Mountains, Churchill County, Nevada. This rock was collected at Stop 3 of the 2011 Earth Science Week Field Trip. C7. Basalt with amygdales filled with calcite, CaCO3, and celadonite, K(Mg,Fe2+)(Fe3+,Al)Si4O10(OH)2, (Miocene age), Lahontan Mountains, Churchill County, Nevada. This rock was collected at Stop 8 of the 2011 Earth Science Week Field Trip. D1. Mafic gneiss (Precambrian age) dominated by biotite, K(Mg,Fe)3AlSi3O10(OH)2) with lesser amounts of felsic minerals (orthoclase, KAlSi3O8, plagioclase, NaAlSi3O8-CaAl2Si2O8, and quartz, SiO2); collected below the “Great Unconformity” (between the Precambrian and Paleozoic eras) at the base of Frenchman Mountain, south of Lake Mead Boulevard, Las Vegas, Clark County, Nevada. D5. Rhyolite vitric tuff (Tertiary age) with black pumice fragments, Jackpot, Elko County, Nevada. D6. Iron ore (Jurassic age), mostly magnetite (Fe3O4), Minnesota (Standard Slag) iron mine, Buckskin Range, Douglas County, Nevada. Samples donated by Alan Coyner, Nevada Division of Minerals. D6. Magnetite, Fe3O4, apatite, Ca5(PO4)3(OH,F,Cl), and calcite, CaCO3, in Jurassic iron ore from the Buena Vista mine, Buena Vista Hills, Churchill County, Nevada. E1. Gneiss (Precambrian age) dominated by felsic minerals (orthoclase, KAlSi3O8, plagioclase, NaAlSi3O8-CaAl2Si2O8, and quartz, SiO2) with less biotite, K(Mg,Fe)3AlSi3O10(OH)2); collected below the “Great Unconformity” (between the Precambrian and Paleozoic eras) at the base of Frenchman Mountain, south of Lake Mead Boulevard, Las Vegas, Clark County, Nevada. E2. Pebble-rich sandstone (Tapeats Sandstone, Cambrian age) collected above the “Great Unconformity” (between the Precambrian and Paleozoic eras) at the base of Frenchman Mountain, south of Lake Mead Boulevard, Las Vegas, Clark County, Nevada. This sample contains small pebbles. E2. Conglomerate, Pennsylvanian Battle Formation from the Fortitude Mine, Battle Mountain district, Lander County. E4. Quartz, SiO2, vein, Comstock Lode, (Miocene age), collected from the Loring cut near the Fourth Ward School in Virginia City, Storey County, Nevada. REFERENCE: Hudson, D.M., Castor, S.B., Garside, L.J., and Henry, C.D., 2009, Geologic map of the Virginia City Quadrangle, Washoe, Storey, and Lyon Counties and Carson City, Nevada: Nevada Bureau of Mines and Geology Map 165, 1:24,000 scale. E5. Rhyolite tuff or ignimbrite (Tertiary age), sample of the Santiago Canyon Tuff, erupted from a caldera in central Nevada and deposited in the Virginia City area (Storey County), later affected by propylitic alteration (characterized by pistachio-green epidote, Ca2Al2FeSi3012(OH), dark green chlorite, (Mg,Fe,Al)3(Al,Si)4O10(OH)2. (Mg,Fe)3(OH)6, here replacing pumice fragments, and white albite, NaAlSi3O8) that is typical of the country rock in the vicinity of the Comstock Lode, Virginia City. Red hematite (Fe2O3) partially replaced some mafic minerals. REFERENCE: Hudson, D.M., Castor, S.B., Garside, L.J., and Henry, C.D., 2009, Geologic map of the Virginia City Quadrangle, Washoe, Storey, and Lyon Counties and Carson City, Nevada: Nevada Bureau of Mines and Geology Map 165, 1:24,000 scale. E5. Andesitic breccia (Miocene age), sample of propylitic alteration (characterized by pistachio-green epidote, Ca2Al2FeSi3012(OH), and dark green chlorite, (Mg,Fe,Al)3(Al,Si)4O10(OH)2. (Mg,Fe)3(OH)6, that is typical of the country rock in the vicinity of the Comstock Lode, Virginia City, Storey County. This rock, a probable lahar or mud-flow breccia composed of various volcanic rock fragments, is part of the Silver City suite. REFERENCE: Hudson, D.M., Castor, S.B., Garside, L.J., and Henry, C.D., 2009, Geologic map of the Virginia City Quadrangle, Washoe, Storey, and Lyon Counties and Carson City, Nevada: Nevada Bureau of Mines and Geology Map 165, 1:24,000 scale. E5. Andesite (Miocene age), sample of propylitic alteration (characterized by dark green chlorite, (Mg,Fe,Al)3(Al,Si)4O10(OH)2. (Mg,Fe)3(OH)6 and pistachio-green epidote, Ca2Al2FeSi3012(OH)) that is typical of the country rock in the vicinity of the Comstock Lode, Virginia City, Storey County. This rock, from a lava flow, is part of the Silver City suite. It contains red hematite, Fe2O3, as filling in fractures. REFERENCE: Hudson, D.M., Castor, S.B., Garside, L.J., and Henry, C.D., 2009, Geologic map of the Virginia City Quadrangle, Washoe, Storey, and Lyon Counties and Carson City, Nevada: Nevada Bureau of Mines and Geology Map 165, 1:24,000 scale. E6. Mickey Pass Tuff (Tertiary age), Pumpkin Hollow, Lyon County, Nevada. E7. Yellow marble (Triassic-Jurassic age), antigorite, Mg3Si2O5(OH)4, a serpentine-group mineral (yellow) with white to light tan calcite, CaCO3, Minnesota (Standard Slag) iron mine, Buckskin Range, Douglas County, Nevada. Samples donated by Alan Coyner, Nevada Division of Minerals. E7. Anhydrite, Ca2S04, metamorphosed Jurassic marine gypsum, Ca2S04.2H2O, from the Adams Claim (Art Wilson Co.) gypsum mine, Virginia Range, Lyon County, Nevada. Samples donated by Alan Coyner, Nevada Division of Minerals. F2. Tourmaline breccia. Breccia fragments of Triassic felsic volcanic rock, Buckskin Range, Lyon County, Nevada. F2. Caliche (Quaternary age), Summerlin subdivision, Las Vegas Valley, calcite, CaCO3, with pebbles of Paleozoic limestone, sandstone, and chert and Jurassic sandstone eroded from the Spring Mountains to the west, Clark County, Nevada. F3. Epidote, Ca2Al2FeSi3012(OH), in hydrothermally altered Cretaceous granitic rock from the Pine Nut Mountains, found in a boulder in Quaternary sediments, Carson Valley, Douglas County, Nevada. F4. Comstock Lode (Miocene age), sample of quartz-veined wall rock and fault breccia from deep in the Comstock Lode, where the vein contains primarily quartz, SiO2, with base metal sulfides, including galena, PbS, chalcopyrite, CuFeS2, and sphalerite, ZnS, from the waste pile at the Kendall cut in Viginia City, Storey County, Nevada. The wall rock, an andesite, is part of the Alta Formation. REFERENCE: Hudson, D.M., Castor, S.B., Garside, L.J., and Henry, C.D., 2009, Geologic map of the Virginia City Quadrangle, Washoe, Storey, and Lyon Counties and Carson City, Nevada: Nevada Bureau of Mines and Geology Map 165, 1:24,000 scale. F5. Diorite (Miocene age), sample of the Davidson Diorite collected from the Loring cut near the Fourth Ward School in Virginia City, Storey County, Nevada. This rock, as are many rocks near the Comstock Lode, is characteristic of propylitic alteration, with patches of white albite, NaAlSi3O8, and dark green chlorite, (Mg,Fe,Al)3(Al,Si)4O10(OH)2.(Mg,Fe)3(OH)6. REFERENCE: Hudson, D.M., Castor, S.B., Garside, L.J., and Henry, C.D., 2009, Geologic map of the Virginia City Quadrangle, Washoe, Storey, and Lyon Counties and Carson City, Nevada: Nevada Bureau of Mines and Geology Map 165, 1:24,000 scale. F7. Tufa (calcite, CaCO3) Quaternary age, collected east of Grimes Point, Churchill County, Nevada. REFERENCE: LaPointe, D.D., and Price, J.G., 2008, No child left inside, A field trip for families and rockhounds, Earth science week 2008: Nevada Bureau of Mines and Geology Special Educational Series E-47, 10 p.
G1. Gneiss, polished pieces left over from making the reception countertop here at the Great Basin Science Sample and Records Library, marketed as Juparana Columbo "granite," India. G3. Porphyritic rhyolite (Eocene age) with phenocrysts of plagioclase, (Na,Ca,K)(Al,Si)2Si2O8, quartz, SiO2, hornblende, (Ca,Na,K)2-3(Mg,Fe,Mn)3(Al,Fe)2-1(Si,Al)8O22(O,OH,F)2, biotite, K(Fe,Mg)3AlSi3O10(OH)2, and sanidine, (K,Na,Ca)(Si,Al)2Si2O8, Tuscarora Mountains, Elko County, Nevada. This 39 million-year-old rock is approximately the same age as gold mineralization along the Carlin trend and many other major gold-producing areas in Nevada. REFERENCE: Henry, C.D., Boden, D.R., and Castor, S.C., 1999, Geologic map of the Tuscarora Quadrangle, Nevada: Nevada Bureau of Mines and Geology Map 116, 1:24,000 scale, with text, 20 p.
G3. Rhyolite (Miocene age) with quartz, SiO2, blackened by alpha radiation damage Toano Range, Elko County, Nevada. REFERENCE: Price, J.G., Castor, S.B., and Miller, D.M., 1992, Highly radioactive topaz rhyolites of the Toano Range, northeastern Nevada: American Mineralogist, v. 77, p. 1067-1073. G4. Rhyolite, flow-banded (Quaternary age), southeastern Truckee Meadows, Washoe County, Nevada. G4. Rhyolite, flow-banded (Miocene age), east of Lockwood, Washoe County, Nevada. G6. Granite (Cretaceous) from the shaft dug for the 12.5-kiloton underground nuclear test, 367 meters below the surface, detonated on 26 October 1963, Project Shoal, Sand Springs Range, Churchill County, Nevada. Several pieces of diamond drill core in the rock garden are from this granite as well. Feel free to take a few pieces for your personal rock and mineral collections, but please take only one of any rock type per person, so that others may collect as well.